Since founding our association in 2009, we have had the policy to exclude stallions from our breeding program, if their breeding results in abnormal foals, such as hydrocephalus or dwarfism. Fortunately, this has not happened yet. Since early 2016, a DNA-test has been developed to scan a horse for these genes, but the BPS is unfortunately not allowed to use this. However, a test has been found, in the United States, that the BPS can use. At the upcoming Stallion Inspection, all approved stallions will be tested. Already approved stallions, must also be tested for the mutation in the coming months. The results will be posted on our website and in our magazine. After 2020, all new studs that are carriers of the gene, will be excluded from our breeding program and no longer will be approved. Studs that were approved before 2020, will maintain their breeding license. What is meant by ‘hydrocephalus’? Hydrocephalus is the medical term for an abnormal accumulation of fluids in the brain. Affected foals will always be stillborn and usually premature. These foals show a clearly visible and severe swelling of the skull. 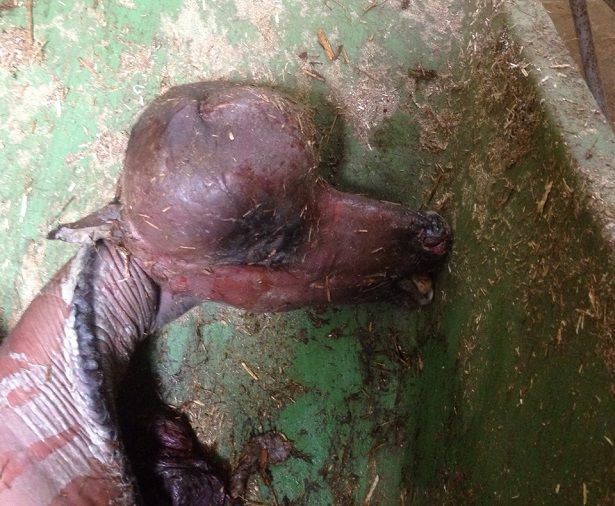 As a result of these abnormally large skulls, the mare has great trouble giving birth, which often leads to (fatal) complications for the mare. Hydrocephalus is very common with Friesian horses, who can pass it to our Barock Pinto offspring. Inbreeding is very common within the population of Friesian horses, the widespread use of some influential ancestors, have most likely contributed to the spreading of hydrocephalus in the population of Friesians. An estimated 20% of Friesian mares and 10% of our Barock Pinto mares carry the mutated gene. When these animals are bred with a Barock Pinto stud that also carries the gene, there is a 25% chance of the foal being born with hydrocephalus. The quickest, though be it somewhat extreme, method to reduce hydrocephalus in the population, is the exclusion of all carriers from the breeding program. By excluding the carrying studs, from the breeding program as of 2020, the owner of the mare does not have to have his mare tested anymore. This helps avoid the risk of an abnormal foal, and the emotional and financial damages that comes with it.